There aren't that many Amiga 1200 owners who've never heard of the clockport. But for those of you who haven't, the clockport is a nifty little connection right in the heart of the Amiga 1200, originally intended for connecting a battery-backed clock and RAM expansion to. However, it was very rarely used for that and was largely forgotten until people suddenly realised that it was quite a versatile port, with good, reliable access to the system's buses, access to interrupts and so on. These people then designed all manner of add-ons to be used on this connector, ranging from faster serial & parallel ports to the CatWeasel floppy drive controller, sound cards, USB controllers, even MP3 decoders. For the A1200 with its limited expansion possibilities, this was an incredible opportunity to use peripherals which would otherwise require expensive and/or undesirable tower conversions and Zorro/PCI bus extensions. This was all well and good, until people started to want to use more peripherals on their machines, and found that only one clockport couldn't cut it. Moreover, people with other machines (A4000s, A600s etc.) were also disappointed that they couldn't take advantage of all these shiny new add-ons. So the clever peripheral engineers and programmers decided to use slightly more clever addressing routines which allowed "shadow" clockports to be created and, with some electronic trickery and driver modification, these shadow clockports could be used for additional devices. It also meant that Zorro cards or hacks could add clockports to almost any Amiga by mapping it to one of the shadow addresses, or even another address entirely if the driver allows it. At some stage, many years ago, I had a CatWeasel floppy drive controller. Great little device altogether from the very talented Jens Schoenfeld at Individual Computers. I also wanted to run a HyperCOM 3+ to give my Amiga a nice modern parallel port and two very fast serial ports. Now, this device should have worked when connected to the CatWeasel, but for whatever reason it never did. So I started investigating the possibility of sharing the clock port. It had already been done I think, but couldn't find any designs, or any manufactured splitters to purchase. I didn't think it would be that difficult, so I talked to Ian Stedman and Jens Schoenfeld, and with help from them both I designed and built my clockport splitter! Now I could surf the web as fast as my dial-up would allow, print nice and fast, and access almost every type of floppy disk you've ever heard of - all at the same time!! Finally, after over 15 years, I have completed a proper version of my clockport splitter! My prototype had held its own, but I eventually gave in and had a proper PCB made. In fact, I had two different versions made. The first was based on my original design, which you can see on the schematics page, which used through hole parts and a simple layout intended to be affixed in a tower setup. 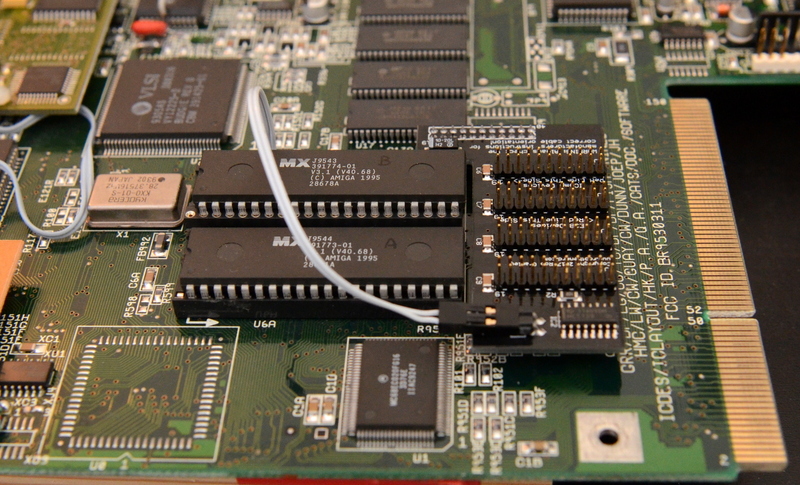 The second version was updated to use SMT parts and a much more compact design, allowing it to be mounted directly on the clockport header on the A1200 motherboard. This photo shows the updated version installed in the A1200.